The holy grail of bags is one that is super durable, very functional, and is reasonably priced. Unfortunately most of the time the reasonable price is sacrificed in the name of durability and features. But that has changed since the introduction of several solid options from TravelPro. They have somehow done the impossible and produced a bag that is both awesome and affordable. This is our Travelpro Platinum Magna 2 review. The Travelpro Platinum Magna 2 is one of our favorite bags. Period. And when you factor in the price, this bag becomes an even bigger deal. We honestly can't believe that TravelPro can pack so many features into such an affordable bag. The Travelpro Platinum Magna 2 is a bag that packs a lot into a very affordable package. The Travelpro Platinum Magna 2 is a great carry on size bag that provides some excellent value for the price. It is 8 pounds and 4 ounces and measures in at 22″ x 14″ x 9″ (standard carry on size in the US). This particular model is a two wheel version but it is also available as a spinner. The spinner loses a bit of internal capacity due to the mounts for the extra wheels, but it has the same overall features and quality. This bag is a little heavier than the Maxlite 4 series but only by a small amount. The Travelpro Platinum Magna 2 somehow is made to similar specifications to bags that are four and five times its price. The outside of the bag is made of very durable ballistic nylon, with leather grab handles on the top and side. The nylon is coated in Duraguard for water resistance but is also woven in a way that makes this bag even more durable than the excellent TravelPro Maxlite series. Everything about the build just oozes quality. In our tests the aluminum telescopic pull handle was free of any noticeable wobble or instability that plagues cheaper plastic handles. To be honest, this is the first thing we check on a carry on bag. Is its handle good? Is it going to go the distance and last you many, many trips? If the answer is no, we don’t recommend that bag. Luckily TravelPro has packed in an excellent handle this time around. Want a four wheel spinner version of this bag? Well, they make that, and its excellent. Check out the spinner version of the Travelpro Platinum Magna 2 here.You’ll sacrifice just a little but of internal storage, but many will welcome the increased maneuverability in the spinner wheels. We’ve said it before and we’ll say it again. We love TravelPro’s Supra zipper heads. These zippers are darned near impossible to damage. And this is a major consideration when it comes to bags that you throw around in overhead bins and check from time to time. My very first bag failed within its first year. It was the zippers that went. You won’t have that issue here. Travelpro actually uses the same kind of wheels that you will see on inline skates. This means that you won’t experience wheels that wear out so fast that they become little nibs within a couple years. And when they are worn down, you can get replacements. One thing to note is that the spinner version has proven easier to drag down airplane aisles due to the way it glides in any direction on four wheels. On the inside, there is a very sizeable main compartment flanked by mesh pockets (ideal for shoes or other little things) and a wet-side pocket for stashing toiletries or other liquids/gels. Lastly there is an integrated suit bag (or tri-fold suiter). This allows you to pack a suit and not worry about horrible wrinkling. Compression straps are also included so you can secure everything before zipping up the bag. The outside pocket is perfect for a large-ish laptop or tablet. In our tests we loaded it with a 15″ MacBook Pro and it fit just fine. And if you want to expand the bag, the zipper actually has a secondary zipper in order to expand the bag a full 2 inches. This could be really handy if you buy too many souvenirs… Just note that expansion will likely tip the dimensions over the allowable airline limit. Liking this Travelpro Platinum Magna 2 review? Well, then check out our other luggage and travel gear reviews here. This is without a doubt one of the best deals in luggage. TravelPro covers all of their bags is their worry-free lifetime warranty which will cover you for normal wear and tear. This isn’t quite as good as Briggs & Riley’s warranty which actually covers airline damage, but its pretty damn good anyway. 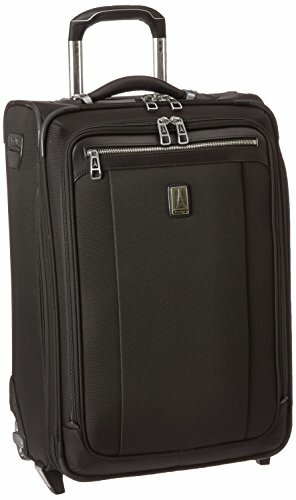 Travelpro Platinum Magna 2 review round-up: Should I buy this bag? If you are a budget conscious business person or just someone who doesn’t want to spend an arm and a leg on a bag but still want something half decent, this bag is for you. TravelPro has really nailed the quality side of things. And they have packed in a respectable number of frills to make this bag totally worth it for pretty much anyone. Sure, the Briggs & Riley Baseline carry on is a better all around bag. But it should be at the price they are asking. Overall this bag rocks.